Family disputes are often symptomatic of larger problems accumulated over time within the family unit and community. What role do the courts play in these crises, when positioned between disputes and family life? 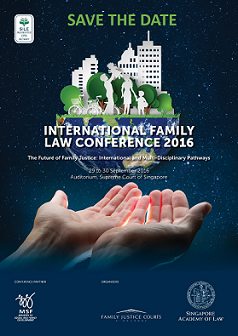 Jointly organised by the Singapore Academy of Law and the Family Justice Courts in collaboration with the Ministry of Social and Family Development, International Family Law Conference 2016 – The Future of Family Justice: International and Multi-Disciplinary Pathways, will focus on the factors fundamental to the effectiveness of judicial decisions. This Conference brings together experts from the legal, psychological and social science sectors to examine how family justice systems around the world have met these challenges and to facilitate an international exchange of insights. Join the conversation from 29 – 30 September 2016 on identifying key demands and projected developments of family justice in the future, and dealing with associated challenges. Save the date at this link.